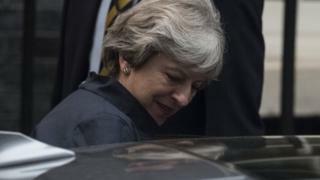 "Magic solutions" were the words used by one EU diplomat to describe what British Prime Minister Theresa May was looking for during her dinner in Brussels on Monday night. These elusive solutions are meant to address what the UK sees as EU intransigence in moving to the next stage of Brexit negotiations: trade and transitions agreements. For now the talks remain at stage one - agreeing the rough outline of a divorce deal, including what happens to Northern Ireland's borders, to EU citizens in the UK and vice versa and how big a divorce bill the UK will pay. I stood outside the European Commission as the informal dinner between Theresa May and Commission chief Jean-Claude Juncker began. A number of Commission employees walked past me on their way home, eyebrows raised. It's seen as ironic by many here that the British government came to Mr Juncker seeking help over Brexit. That same Jean-Claude Juncker is painted almost as the devil incarnate by some British newspapers. But the UK has caught glimpses of flexibility from the EU's chief Brexit negotiator, Michel Barnier, who was also at Monday night's dinner. He recently raised the possibility of moving to stage two of the talks. 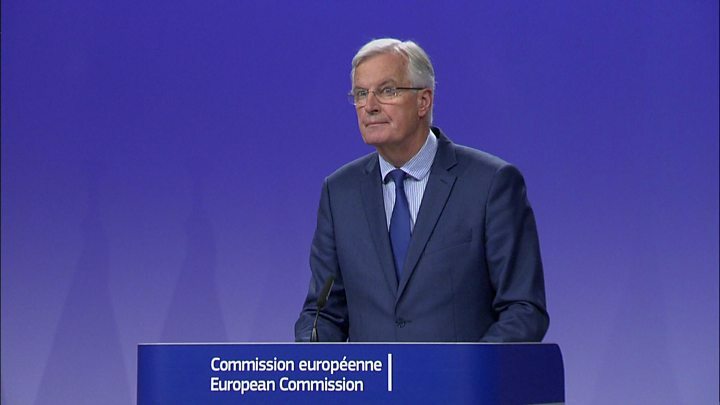 Although Mr Barnier complained last week of deadlock between the UK and EU over the Brexit divorce deal, he has recognised that good progress has been made on other issues. "Theresa May still doesn't understand how Brussels works," one diplomatic high level source complained to me. "Even if the Commission thought it were time to move on to transition talks, EU member states are their master in this. And they won't budge on money." And that's what it comes down to - money. German Chancellor Angela Merkel told the prime minister in a phone call this weekend that she needs to elaborate on the Brexit speech she gave in Florence last month, when she insisted Britain would honour commitments made while it was an EU member. But which financial commitments exactly? EU countries want to know. EU sources emphasise they understand the British argument that it can't commit fully to a divorce bill until it knows what the future relationship with the EU will look like. No-one expects the UK to agree a final sum until all negotiations are over. They say they don't need the i's dotted and the t's crossed. Does the UK owe the EU money? What would 'no deal' look like? But what the EU wants from the UK now is a list of liabilities it accepts - such as pension payments, contributions to multi-annual budgets and loans to countries like Ukraine and Turkey. Reports in the UK of late have focused on Germany and France being the main blocks in the road to talks of transition and trade. But sources close to Mrs Merkel told me that, while a couple of EU countries are keen to move forward, the majority demand "more progress on the financial settlement first" . This is EU-speak for wanting Britain to cough up more cash. Of course German taxpayers are reluctant for the UK to pay a smaller sum than the EU is looking for. As the biggest net contributors to the EU budget, they know they'll be under pressure to make up the shortfall. But smaller countries also clamour for UK feet to be held over the fire. A big hole in EU finances means they risk losing subsidies, grants and infrastructure budgets. On Monday night post-dinner, when Mrs May's office jumped on Mr Juncker's joint statement with the prime minister agreeing that Brexit talks should be "accelerated in the coming months", EU eyes rolled again. "We all want acceleration. That's hardly news," one European diplomat told me. "Time for talks are running out and we all - the UK and EU - want a deal but London has to move over on money or negotiations will move nowhere." The UK had hoped the EU would vote to start Brexit discussions on trade and transition deals at a summit of EU leaders later this week. But the EU has no intention of allowing the UK to use the money issue as a bargaining chip when discussing their future relationship. That's why Brussels insists on separating settling the UK's financial liabilities - which, it says, deal with past commitments - from discussions on trade and transition, which look to the future. Talking about this to a group of European students last week, Mr Juncker said - imagine going into a bar, inviting your friends to a round of drinks and then telling them they have to pay the tab themselves. That's how the EU views the divorce settlement with the UK. The British government has signed up to the sequencing on Brexit talks. Now the EU says it must respect the plan. Frustrated German MEP Jens Geier told me that blaming Germans or the French for lack of progress was ridiculous. The UK needed to bring concrete proposals to the table, he said. Theresa May has been told that the EU will approve moving to stage two in December at the earliest - during the next EU summit. But there is one condition: as the famous song from the film Cabaret goes, "money makes the world go around". The EU insists it is what will make Brexit talks accelerate too. Brexit: Does the UK owe the EU money?